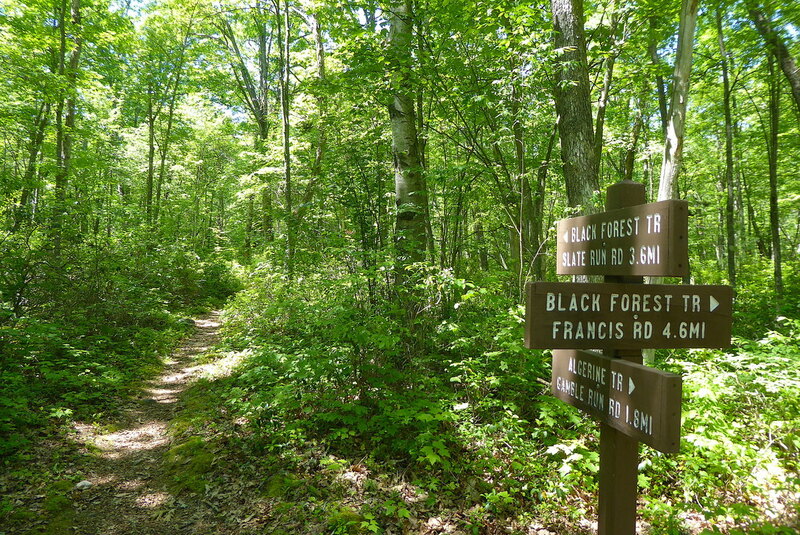 ​The Black Forest Trail (BFT) is an amazing 44 mile trail consisting of steep climbs, descents, and vistas throughout Tiadaghton State Forest. The main trailhead is just off of route 414 in Slate Run. There are also parking areas on top of the plateau along route 44 north of Haneyville. Multiple ‘bail out trails’ within this loop provide various hiking routes and experiences. Backpacking this loop in its entirety is daunting for most people; many hikers claim that this is the hardest yet most rewarding backpacking trail in the state. 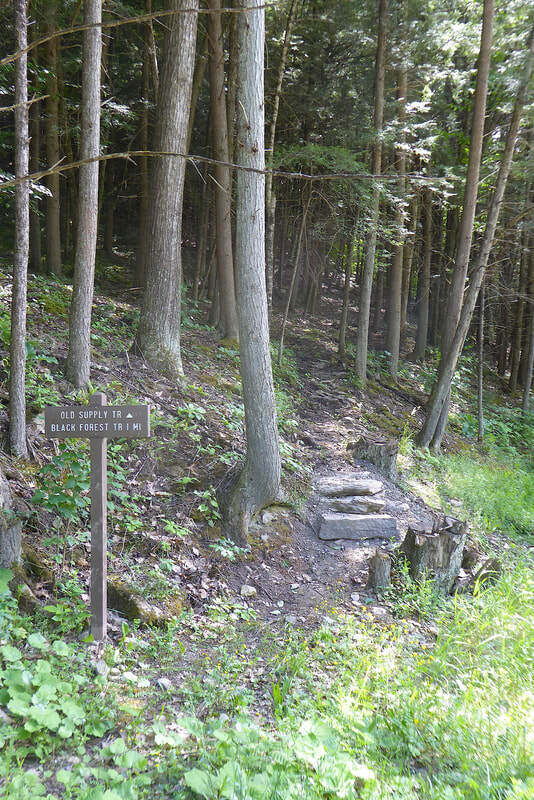 The trail is maintained by DCNR along with volunteers from the Keystone Trails Association. ​I thought I was going to die the first time I hiked the BFT. In two days and 44 miles we had seen bears, snakes, bugs, rocks, and dry streams. It was July and yet my body stopped sweating during the last climb (I had been out of water for several miles). Fast-forward eleven years and although I've hiked the trail many times, I almost died again this spring while hiking the BFT: I broke out into a full body poison ivy reaction a day after returning home. I’ve learned a lot in the last eleven years, and I still have more to learn: First lesson of The BFT: Water management. There is plenty of water along this route, but if you carry too much your pack will be heavy for the excruciating climbs. On the other hand, if you carry too little water, you may find yourself in a really bad situation. Second lesson: If you enjoy working hard to reach amazing vistas, then the BFT is the trail for you! This trail provides dozens of great vistas throughout the year.​ Reaching some of these vistas requires an elevation gain of over 1,000ft! Lesson three: Hike your own hike. Many side trails and ‘bail out’ routes within this system allow hikers to decide whether to stay on the plateau for easier hiking, or drop into the canyons for a more difficult experience. Thanks to DCNR, KTA, and local volunteers, many of these trails stay in good shape. ​Lesson four: Utilize Hotel Manor and Wolf’s General Store in Slate Run! Since the BFT was rerouted near Slate Run, I now stop at Hotel Manor for a hot meal. 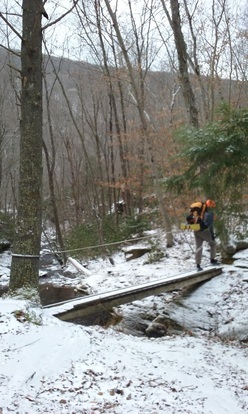 Other times I’ll walk across Pine Creek to resupply at Wolf’s General Store. The southern section of the BFT is much more strenuous than the northern section. 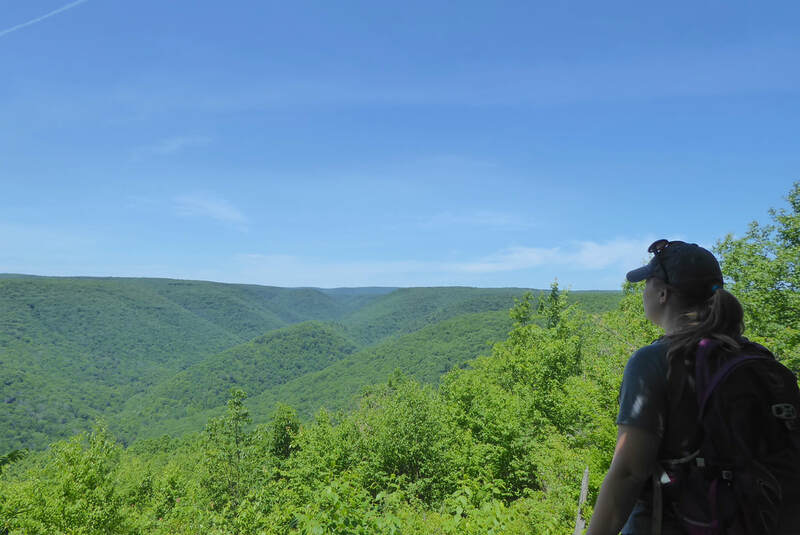 When I only have two days to hike this trail, I minimize my efforts by carrying less food and kitchen gear: Park on route 44 at the Ruth Will Lot and hike counterclockwise roughly 20 miles towards Slate Run. Rather than carry a bunch of food and a stove, enjoy a warm meal at Hotel Manor and resupply at Wolf’s General Store for day two! 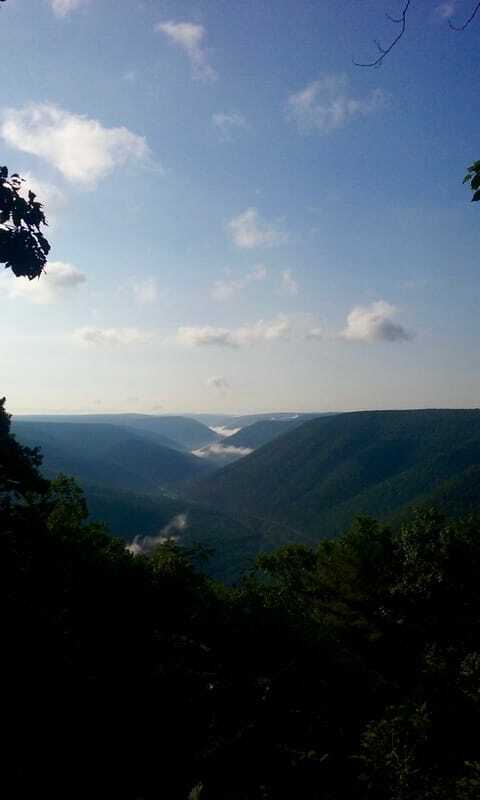 Lesson Five: Northcentral Pennsylvania is a wild place! Be prepared for the conditions, and keep an eye out for snakes, bears, ticks, and other local forest inhabitants! 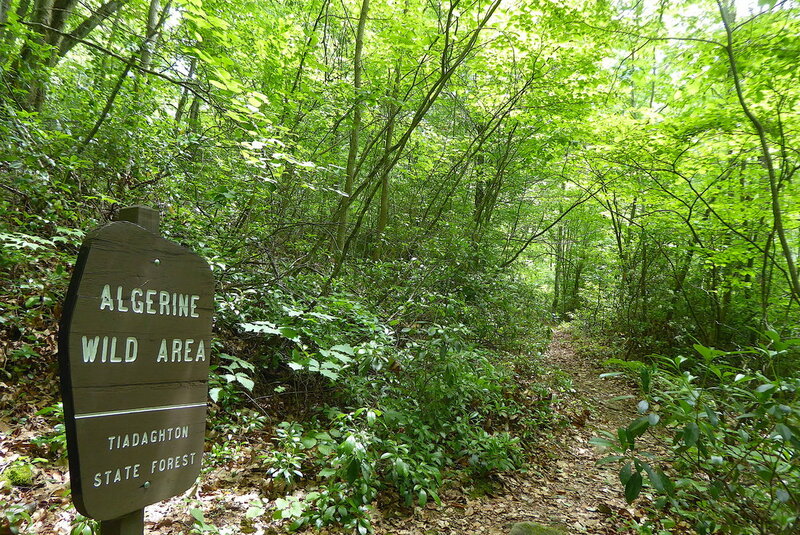 Bonus lesson: once you've had enough of the Black Forest Trail (or if the trail is too popular for your taste), consider hiking the Tiadaghton Trail-Mid State Trail Loop which is just a bit further downstream along Pine Creek! Find The Black Forest Trail on Purple Lizard Maps Pine Creek Map!